Christmas only comes once a year! What to do the rest of the year? rebuild a June 1944 Ford GPW jeep. Have a look at the project via the Tabs above. The Lights are on at Van unen Court, Doncaster East. Once Halloween is complete, the setup fro Christmas begins. My preparation this year has been as hectic as the last three years, with too many tasks to have completed before the lights turn on. This year there have been a number of major changes. I am now using DMX controllers for 75% of the channels, and RENARD Controllers for the rest. The majority of the DMX controllers were designed by a friend in the US. Each controller is 8 or 16 channels and control the DC LED strings and display items. I am also using DMX controlled Pixels and a new Pixel sourced from China. You will see a lot more use of colour this year, I have RGB LED Floods on both the top and ground floors of the house. Many of the popular decorations are back again this year, the 20 foot Megatree and the Leaping Arches. The goal was set to be live by December 1st, and we got there! not without some tears and terse words. I am still making adjustments and will be adding songs and more lights over the next three weeks. I changed the program around and the music is now being transmitted on a small FM transmitter. Tune to 89.1 FM and listen to the music while you watch the lights. I have always liked the Red Green and Blue effects I have seen in the States. This year, I have upgraded all the mini trees to RGB, the effects are great, and very bright.. 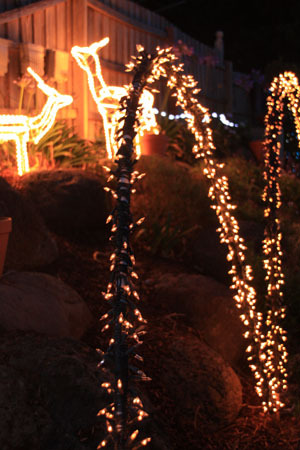 While years of drought were no fun for the garden, it was at least easy on the lights. With more rain this year, the setup has been difficult, and water and electricity does not go well together.